Sonos has some solid sales going for Black Friday 2018, including discounts on the Sonos Beam, Sonos One, and Sonos SUB. Those are all great products, which is no surprise considering all of the smart speakers Sonos makes are outstanding. But there are some other Sonos speakers that are always best-sellers during big sales events, and Sonos doesn’t have official discounts on them this year — namely the Sonos Playbar, which is arguably the best sound bar on the planet, and the Sonos Play:1. Lucky for you, that’s where Amazon comes in. Amazon has secret Black Friday deals running on both of those wildly popular Sonos speakers, and they’re not being advertised anywhere. Of course, that’s why you follow the BGR Deals team, so you can take advantage of all the killer deals that most other people don’t know about. So here’s what we’re looking at: the Sonos Playbar TV Soundbar will cost you the same $699 on Amazon that it will straight from Sonos, but you get two extras from Amazon. First, you get a free Sonos Wall Mount Kit that costs $40 from Sonos. On top of that, you get a $50 Amazon gift card that you know you’re going to use right away on other Black Friday deals. That’s a $789 value for $699. 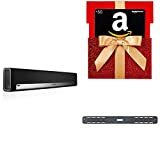 Then, if you want to create a true surround sound experience or if you want to stream stereo music in any other room of your home, you can pick up a 2-pack of Sonos Play:1 speakers for $298 and you’ll get a $30 Amazon gift card with your purchase. But wait! There’s a third Sonos deal on Amazon that you won’t find anywhere else. Looking to tie some conventional wired speakers in with your Sonos system? 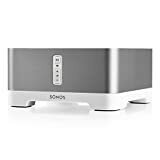 Pick up a Sonos Connect:Amp on Amazon too, which is on sale from now through the end of the day on Cyber Monday. Playbar complements HD television screens with crisp and powerful sound from nine amplified speaker drivers. Wirelessly streams all your favorite music services too. Playbar syncs wirelessly with other Sonos speakers so you can listen to TV or music in perfect sync, throughout your home. Playbar has simple two-cord setup. One for power and one for the TV. Control from your existing TV remote, or wirelessly connect on the Sonos app from your smart device. Wall Mount makes Playbar easy to install to any wall with pegs in precisely the right place. More sonic punch. Built-in amplifier powers large or small speakers. 55 W per channel at 8 Ohms. RCA line-in for connecting a range of playback sources. Subwoofer line-out. Control wired speakers from anywhere in your home with a mobile device such as your smart phone. Connect to patio or poolside speakers for outdoor listening entertainment. Connect to any Amazon Echo or Alexa-enabled device, then just ask for the music you love.